This is Chapter Five of Communists Today (Kommunisten Heute) by Hans Heinz Holz. Chapter Five is entitled “Towards a Clear Understanding of Our Epoch.” Other chapters are posted on MLToday.com. We thank the Northern Communists of the CP Britain for the translation from the German. The character of an epoch is not shaped by individual political events, however incisive and revolutionary they may appear to those living through it. In Britain, when the Stuarts returned from emigration (1660), 11 years after the execution of Charles I, and reinstalled the rule of absolute monarchy for almost 30 years, that remained a unique episode in the “century of bourgeois revolutions.” Likewise, the Bourbon Restoration after 1815, led by a ruling class seething with hatred at its own defeat, was unable to wipe out the effects of the French Revolution. The era of feudalism had passed and the victory of the bourgeoisie, despite setbacks, was unstoppable. Industries, railways, and financial institutions were more powerful historical forces than the state authorities of the Holy Alliance; after all, they determined the means of production of the new era, and for their development they needed a new social order and new relations of production. · Which productive forces are at the disposal of an era? · With what means are they used? · In what organizational forms of work, trade and distribution, of ownership and legal arrangements, does this use occur? · What corresponding and what contradictory interests arise under the ruling relations of production? · How do the multifarious individual purposes accumulate into supra-individual class interests, in which the leading contradictions of an era are expressed? Those are the questions which we must answer, if we want to gain clarity about an era’s tendencies, rather than focus on the momentary occurrences of a day or a year. Whatever occurs yesterday and today, here and there, is an indication which only discloses its meaning to the detective shrewdness of observers, if they track down the general forces working under the surface. Historical materialism is the method of such detective investigation: the development of productive forces, and the outworn nature of the production relations vis-à-vis the new developments, are the key to determining the character of an epoch. Thse are a valid description of this process, for the whole development of capitalism, right up to automation and information technology. Since the end of the 18th century, science and production have coalesced into a unity, through a more and more scientifically-applied technology. Science has even become a primary productive power, with a quickening rate of growth in knowledge increasing without bounds. This knowledge has achieved not only a gigantic scope, transcending every individual intellect, but also a quality engaging with the deep structure of matter (e.g. particle physics, molecular biology, genetic engineering, and psychopharmacology). Despite these massive achievements in individual spheres of knowledge, there is no socially uniting philosophy through which individuals can situate themselves in relation to the whole. Scientific discoveries are applied to the individual purposes of the owners of the means of production, i. e., their production is steered by criteria of individual utilization. Furthermore, instead of individual capitalists, today we have great capital concentrations, combines, and finance companies, which pursue their own particular interest of capital accumulation with even stronger application of means and power – and much more exclusively than do individual capitalists, who still have private personal motives, which are suppressed in anonymous companies. The law by which the Industrial Revolution took place more than 200 years ago is still valid today: it is the Law of Accumulation of Capital. Private capital must be invested in order to produce surplus value, i.e., to yield private profit, which is again turned over into new investments. Moreover, individual capitals have for centuries been independent of their owners – capital becomes a “self-expanding value,” it “assumes its pure fetish form.”⁵ This is the abstract inevitable conclusion of capital’s self-expansion. Thus, people’s relation to capital, which is the concrete (and thus alienated) form of social life in bourgeois society, stamps all outward manifestations of that social life directly or indirectly. The advances of the scientific-technological revolution, which could be used for the freeing of people from external constraints, thus serve for the subjugation of people in order that capital can be utilized as an end in itself. Utilization of capital means perpetual increase in productivity, to whatever purpose and with whatever content, with equal validity. However, that also means perpetual creation (and, if necessary, manipulation) of new needs, which can keep pace with the increasing profit-generating commodity production. It is not the concern of Communists to accept uncritically this expansion of needs, nor indeed to regard it as progress in the living standards of the masses. The 20th Congress of the Communist Party of the Soviet Union (1956) made a basic conceptual and developmental error in proclaiming the economic and social aim of catching up – in whatever time-period – with the living standard of the USA. This indicated a submission to the mechanism of continually increasing commodity production and thereby the surrender of Communist values to the petty-bourgeois ideology of self-serving production. The program of a Communist society includes the abolition of people’s alienation from commodity fetishism and the development of values of human self-realization – a self-realization which expresses itself in the culture of life and not only in standards of consumption. It is precisely technical progress, which step by step removes the burden of oppressive toil and gives people more time free from labor, which enables the widening of human capabilities and activities, the differentiation of human interests and the development of a new content for human life. The transition to a new human culture with all-round human development is the opportunity of an epoch in which productive powers have reached a level which could guarantee the satisfaction of the material needs of humanity as a whole. Unchecked, almost every individual need will increase. The strategy of continual expansion of commodity production, the form of existence of capitalism, taps into this tendency. However, it soon becomes clear that a one-sided strategy of development leads to unresolvable inner contradictions in the total system of human activities. Corresponding to the acceleration of technological innovations, we get the frenzy of alternating modes of consumption. Every material product needs natural raw materials, while all material wear-and-tear yields waste materials, which are returned to the natural environment. The scientific-technological revolution, as realized under capitalism, is a double burden on our natural living world. It exhausts resources, and through emissions it destroys the physical, chemical and biological equilibria of our environment – the conditions for human survival. The possible blessing of scientific-technological progress becomes the curse for humanity under capitalism. The environmental crisis is a consequence of the political-economic order under which we are living. (Even the socialist states yielded to this compulsion under the pressure of economic competition with capitalism inside the capitalist world system – and all economically weaker countries are subjugated to the laws of the economic system of “big industry.”). In the form given to it by the utilization of capital, the scientific-technological revolution determines the face of our world. With its newest productions it shapes the type of development of countries which must for the first time slowly and painfully reach out towards the level of the industrialized states. For the productivity of modern industry to be able to contribute to the development of the masses of a country, there needs to be, as a starting point, a certain stage of development and – perhaps only a modest – level of prosperity. Otherwise the poor can become neither qualified workers nor consumers. Capitalist development strategies – aimed not at the development of people but at the utilization of capital – are not suited to creating this starting point. Only solidarity programs, applied on a long-term basis, could overcome the technical backwardness and bring about an adaptation to changed attitudes and behaviors, which correspond to a generation-long process of development (as that which the technologically advanced countries already have behind themselves). Short-term and medium-term expectations of profit must thereby lead to a policy of investment which opens up a chasm between a small layer of beneficiaries of progress and the ever- widening impoverished masses, and puts in place a continuous crisis for hundreds of millions, perhaps billions, of people of the poor countries. Capitalism has at its disposal no instrument for solving with human dignity the problem of underdevelopment. The limitation of resources and sales markets, which stand at the disposal of wider capital expansion, sharpens a contradiction already inherent in capitalism, and always inherent in it. Forces of capital must attempt to displace other such forces. Since the beginning of capitalism, competitive struggles have belonged to its history. Concentration has resulted from the victory of the stronger over the weaker. Today, in the double movement of competition and concentration, three economic superpowers or power blocks have developed: the USA (with its satellites), the EU (with the German claim to hegemony) and Japan-Southeast Asia. The tensions between these power groups are obvious and are confirmed every day by new signs of cause for conflict. Politically these conflicts are already expressed in numerous small “proxy wars”: the Gulf War over oil, the smashing of Yugoslavia in a bloody civil war fomented from outside, the conflicts between Armenia and Azerbaijan, the war in Chechnya, the struggle against the Kurds, the aggressions against Libya – in many places in the world, military conflicts either exist or threaten. Since the disappearance of the Soviet Union and of the world-political equilibrium of the so-called “superpowers,” the world has become less safe. In the background of the “small” wars stands the rivalry of the “great” powers and the specter of a future war between them. In capitalism there is no means to order unity for capital expansion (and thereby for the conflict between the capital groups and their political-state helpers and accomplices). Capitalism is not capable of peace. The global problems are an expression of a systemic crisis of capitalist society, sharpening towards the danger of humanity’s self-destruction. The structural organization of the capitalist economy – self-realizing value or interest-yielding capital – stands opposed to a solution of these problems. All interventions in the system which aim to address the greatest grievances, fully or partially, in one place or another, remain insufficient and in the final analysis are condemned to failure, as long as the actual basic cause of all grievances, the systemic imperative towards accumulation of capital, is not removed. The prerequisite for overcoming the crisis is a change of production relations. System changes take place after a long period of preparation. Before the revolutionary upheaval succeeds, many small reformist steps occur, in order to adjust the unsuitable system to the conditions for its survival. These steps are the first sign of a transition – but they are only so if they are grasped and used as an initial spark to wider changes. That does not mean that reforms are superfluous or – because they stabilize the system for the mid-term – undesirable. This left-radical short circuit forgets the dialectic of the transformation of quantity and quality. The new quality, i.e., the new political form of organization of production relations, does not arise, so to speak, from a “big bang” in the heart of the old society. Rather, it emerges after many small changes which have already perforated the systematic unity of this society, i.e., from a mass of interventions, which go over at one point into the new quality. Adjustment and break are two sides of one and the same process. However the change-over or break does not come “by itself.” It always requires active subjects, who want it, push on ahead with it, and put it into effect. Reformist ideology contents itself with changes inside the existing system and succumbs to the illusion of being able thereby to do away with the shortcomings, which are in fact inherent in the system as a whole. Such changes therefore contribute to the maintenance of the system – though it is much more the ideology of reformism which is system-stabilizing, because it cripples the will for revolution and finally serves to justify the suppression of revolutionary impulses. History nonetheless follows its own law of motion; humanity does not want to face ruin, and thereby pushes development further – up to the overthrow of the existing social relations. Real revolutions do occur not often, and they affect the whole of society in all their manifestations. In them a social formation is broken asunder and the basic model of a new formation comes to the fore in a first design. The break-up is preceded by a long process, in which the existing formation develops cracks and becomes dilapidated. And much of the first design of a new social order is changed again, until a stable structure arises. Revolutionary transformations are not solitary experiences, in which the whole new society immediately dawns; they extend over a lengthy period of struggles, in which upheavals and reverses, victories and defeats follow one another. In the course of this, however, there are decisive turning points, at which the epoch-making nature of the changes becomes all at once clear, so that we see that a change in formation has begun. Those are the experiences from which the bugle-call for a new epoch goes out: in them is consolidated the revolutionary process to revolution, which is the sign that determines the epoch. The crisis of capitalism, which arises from the destructive sharpening of its inner contradictions, is a phenomenon of the twentieth century. It was first displayed in the totality of the First World War. In this first eruption of the general crisis, Tsarist Russia – still at the threshold of industrialization, and in which the struggle by the mass of the people had not yet achieved bourgeois democracy – broke apart under the impact of military defeat. Faced with the furious pressure of the masses of workers and peasants, the weakly-developed bourgeoisie was unable to put any functioning bourgeois-democratic order in place of the tsarist dictatorship, and was swept away. The “weakest link in the chain” of the capitalist world system burst. In this special case it was precisely the unripeness of the conditions which made the socialist revolution possible. While in other cases the revolution was the high point or culmination of a revolutionary process (like the French Revolution of 1789 or the bourgeois revolution of 1848), the October Revolution stood at the beginning – and likewise indeed the young Soviet Union also stood at the beginning of the worldwide process of the transition from the capitalist to the socialist society. It was a bugle call to break out into new historical territory, not a final seal on historical changes already fully carried out. It marks not the victory of the proletariat, but rather the start of a long struggle for a classless world society, of a struggle against a still powerful superior opponent. With the October Revolution there began the epoch of the revolutionary process, in which capitalism will be overcome and the scientific-technological revolution will be placed at the service of people (instead of exploitation of capital). The rise and fall of the Soviet Union was a first phase of this epoch. With the sharpening contradictions inside the (apparently victorious) capitalism, we are already in a second phase. The decisive question of the epoch however remains the same: socialism or barbarism. The October Revolution put down an everlasting marker: the weak and the excluded, the exploited and the oppressed, have the power to rise in revolt. They have the power to build up their own state, their own society, and to set limits on a powerful enemy. 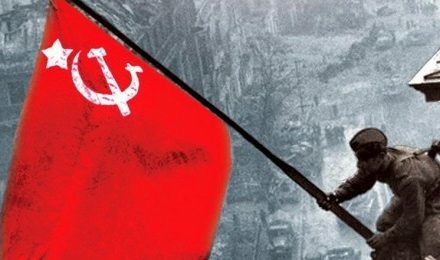 It was the Soviet Union which brought about the downfall of fascism, it gave backing to the movements for colonial freedom. Many social concessions in the capitalist countries were made with the view towards the socialist alternative. The “specter of communism” struck terror in the ruling classes. Nonetheless the first socialist social system collapsed. The economic basis was too weak to be a match for the clash of systems with capitalism while at the same time bearing the social construction of the Soviet state. The continuation of the revolutionary process after the October Revolution under the conditions of backward development of productivity and political-military encirclement brought with it more and more deviations from the revolutionary aim. Instead of the free association of producers a bureaucratic apparatus consolidated itself, without which the construction of the powerful Soviet realm could not be achieved. The Party was no longer the vanguard of social progress but rather became the holder of state functions, and thereby indeed an instrument of rule, instead of being the medium of developing the collective social will. It was not a matter of the integration of the masses into a complex system of institutions of self-determination. Thus individuals uncoupled themselves more and more frequently from responsibility for social life, and in the crisis the preparedness for defence and renewal of the socialist society was lacking. Does that mean that the October Revolution failed? Or, indeed, that it was it a misfortune for humanity, because in its wake the idea of socialism decayed? Those who, in a fundamental misunderstanding, regard the October Revolution as an act of realization of socialism, will formulate these questions and answer in the affirmative. On the other hand, those who grasp that the October Revolution was the dawn and not the mid-day hour of a world-historical age, will not need to renounce the sunrise, just because a cloudburst obscures the sky in the later morning hours. Lenin said: “That era has dawned” – and not, by chance, “The moment has arrived.” He was aware that this would be a long-duration phase of world-historical development. In 1917 the era of the proletarian revolution dawned. But even revolutions which break out at the high point of social-historical development do not proceed without reverses. The great French Revolution of 1789 ratified the transition to bourgeois society, which had already been gradually occurring for more than a century through changes in the production relations. Later, with the Vienna Congress of 1815 (after the military defeat of Napoleon) and the “Holy Alliance” of the Russian tsar, the Austrian emperor and the Prussian king, the powers of reaction succeeded in restoring for a generation the form of rule of the absolute monarchy. Did the 1789 Revolution thereby fail? Were its ideals refuted? In no way. The advance from feudalism to capitalism and to bourgeois democracy was only delayed, not halted. The best minds of the time gave full recognition to the great Revolution, even during the period of reaction. It is reported that no less a figure than Hegel – wrongfully accused of being a “Prussian state philosopher” – would at times on Bastille Day, July 14, propose a toast to the Revolution. The October Revolution is the historical decisive turning-point from which the current epoch of human history takes its beginning. With Red October the struggle for the removal of bourgeois society began: in this first attempt to construct the social formation of socialism, the logical “determinate negation” of capitalism has achieved a historically determined concrete reality: the annulment of private appropriation of the socially created surplus value, i.e., the abolition of private ownership of the means of production. It is self-evident that the owners and managing directors of capital would not accept this without resistance. Given that they had massive material superiority at their disposal, the fact that they had the opportunity to win the first battle is no ground for defeatism. Much the more, the present victory of capitalism cannot obliterate the historical success, that this socialist society in construction was not only able to resist for more than 70 years and thereby rise to the level of world power, but also realised in many areas a functioning model of a new form of commonweal. Examples have been put in place, which persist in the consciousness and can motivate the political activity of people. Real progress in history does not occur in a linear fashion but rather in the here and there of forward strides and reverses. History is also always, as Hegel said, a “progress in the consciousness of freedom,” since what humanity has at one time achieved, is not forgotten and continues to work in the “realm of imagination.” Thus the October Revolution marked the instant from which the epoch of the transition from capitalism to socialism will be dated. In any case, the transition in itself is still uncertain: it can succeed or fail. Without a struggle for the new society it cannot succeed. The owners of capital (for whom, in the fetish of capital utilization, a fall in capital still appears as profit for some) are obliged to oppose the change in production relations. Only the class which does not appropriate the surplus value, but rather just creates it, has no interest in the continuation of capital accumulation and can change the system without contradicting itself. Those who sell their labor power, from which others skim the profit, have no basis for defending the interests of the capital owner, at the price of labor power’s own downfall. They must become conscious only of their class situation, in order to understand their place in the basic contradiction of the epoch. The crisis of capitalism is an inherent certainty of the capitalist economy. The overcoming of the crisis is a class question. Thereby the transition in our epoch is a transition to socialism or to nothing. We have every basis for not forgetting the shots of the cruiser Aurora, with which the October Revolution began. As Goethe could say at the cannonade of Valmy – where French revolutionary soldiers put to flight the Prussian-Austrian army of intervention – here a new era has begun. Likewise we may hold fast to the point that the Aurora’s salvo inaugurated a new epoch. At its end humanity will have given itself a new social order, or will have lost its human nature. With these alternatives before our eyes, the October Revolution remains a sign of hope and commitment. The Internationale unites the human race. 1. K. Marx, Capital Vol. 1, Chapter 15, MECW 35, p. 374 ff. 5. K. Marx, Capital Vol. 3, Chapter 15, MECW 37, pp. 390, 391. 6. V. I. Lenin, Imperialism, The Highest Stage of Capitalism, in Collected Works, Vol. 22, p. 185 ff. 7. V. I. Lenin, Collected Works, Vol. 24, pp 459-460. Marxist Education	Why a Revolutionary Working Class Newspaper?